Driving in Thailand for the first time can kill you, unless you prepare yourself with our travel tips. The accident statistics in Thailand are frightening: about 20,000 death Thai drivers due to road accidents. Only if you are a confident driver and you are aware of the driving conditions in Thailand, then driving is a great way to travel around the country and will give you the freedom to really explore. There are plenty of reputable car rental firms in Thailand like Avis, Budget, Hertz, Via and Braun. A typical rental car in Thailand would be a Toyota Soluna at around 1500 to 2000 baht (about 50 to 65 $) for a day. 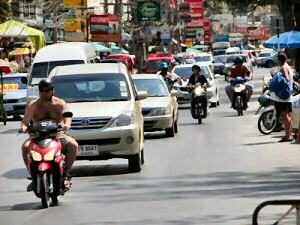 always look everywhere and remember: westerners due take driving conventions for granted, some Thai drivers just don't! their left hand indicator signals that it is safe to overtake OR that the car is turning! One good thing about driving in Thailand is the overall Thai cultural habit of not getting angry in public. So when the Thai do get angry, you can rest assure that your driving is not at all up to Thailand's standards!